kat wrote this on steam yesterday "There are more maps coming in the October update (as well as a couple more Elites). We'll be revealing them in the lead up to the patch!" So exciting. So I think there is at least 1 new map to come and obviously 1 new Ork elite. 1 extra, either a 3rd new map, or more tantalisingly, maybe a tease of Necrons...we would be in heaven boys. I know, I'm very optimistic ... it's inevitable. i would love another map that is good for both 2vs2 and 1vs1. Interesting choice, Bigamo. Considering that the only official map in this game that supports both 1vs1 and 2vs2 is Mork's Mire. Wraithlord they mean the elite man. But line unit rosters may get improvements if relic feels that certain rosters have weaknesses or less options. Just look at DoW 2 for example relic added line units based on weaknesses. Chaos didnt have jump troops so they gave them noise marines (which were op by the way lol) to make it easier to shut down devestators and range squads. New elites and maps are always welcomed, but I really would like to see new races, or at least a teaser for it. New map revealead to be 2vs2. Wow! Nearly no days without good news. I like it that way. I guess, Relic is supposed to add some "seismic" effect to seismic attacks of Ironclad as well as doctrine-affected mines and, probably, LS, too. They're teasing Writhseer and.. BOO, another walker, we have expected more. Just try to put these 3 into the combination, that won't result in the BOO at the end. Yes, they have to be wise about their resourses. Which mean to re-use stuff in the way so no one would notice\complain. well, she said MORE MAPS, so probably at least 2 more maps i think? The discussion she was replying to was one that was asking about the potential of new maps, made before the first reveal was made (though her comment was after the first reveal), so I think we can assume she meant both the 1v1 map and the other one that we know about. Though, a third one would be very nice. I'm just happy that we're getting so much content, particularly in my birth month xD Such lovely presents, Relic! Also to add, someone on twitter has took the sneak peak as a form of preparation on Imperial Guard DLC. Indeed, if you look at a stone head on picture, it looks like a Guardsmen. Though I'm not sure. Relic cant possibly favor Imperial Guard over the likes of Necrons, Chaos or Tyranids. COME. ON. Dont get your hopes to high there are many statues on the maps. We have human soldier statue on imperial knight world populated entirely by humans.... wooooo, who would have expected! It must mean IG! Seriously, some people are trying way too hard. There is not a singular reason why IG would come before any of 4 other long time no seen factions. Look it up on twitter replies, facebook comments, steam forums and even here: do you really think IG would be the best race to drawn back peoples attention to the game? right now the demand for IG tops only Tau,Sisters of battle and maybe Dark Eldar. Chaos ,Tyranids and SPECIALLY necrons (a fan favorite we didn't see since Dark Crusade) are much more requested. And that's not a opinion, that's a fact. Demands for Tau are actually larger over IG and i'm still trying to believe that it is also more requested than Chaos and Tyranids. it's 955 for the 3rd pick, but 928 for the first one each time I count. They've allowed for "none" to be picked, but didn't add it to the result? If it's not me, they've mess it up. 994 for the first pick. For the none result just deduct the result from 1009. IG would be a good fit for DOW3 since army size is so much bigger. Lot's of cheap troops and tanks. I still think adeptus mechanicus would be a really cool alternative to IG. I feel like there aren't too many surprises left with IG. I'd play em though. If i see tyranids before chaos necrons and ig i will be somewhat dissapointed. For some reason i find them really dull compared to every other major faction. Tyrannids and Astra Militarum, would be perfect on this game's scale level. I'd love to see IG because I fall for them. 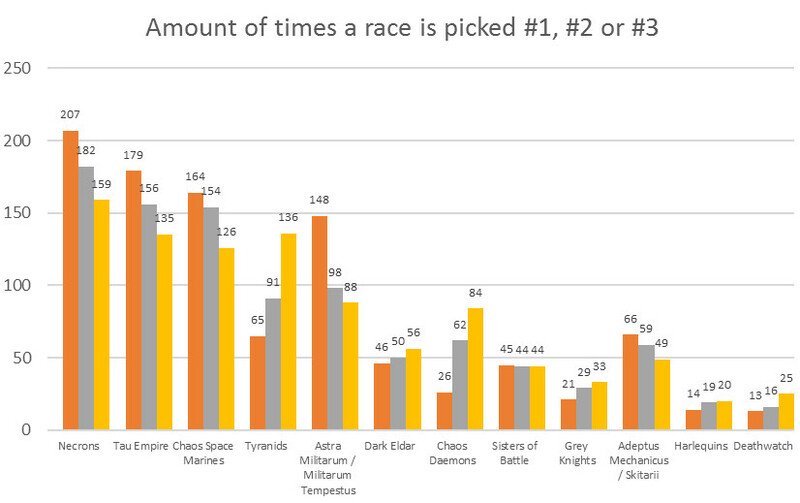 But I dont mind Tau or Necrons (both at best) showing up first - just for the sake of the games future. influx of Players!! !